Looking for a new job? Though there are other means of finding out about job vacancies, job boards are still often the first point of call for job seekers. So which one should you use? What is the state of employment in the UK in 2016? 31.4 million people were employed in 2015, which was up from 30.8 million in 2014. The current unemployment rate in the UK is 5.1%, down from 5.8% in 2015. Average wages rose by 2% in 2015. How are job boards used? 26% of recruiters say that job boards are their primary source for finding candidates who are ultimately fired. 42% of sources admit to making no effort to optimise their jobs to be found by job seekers. 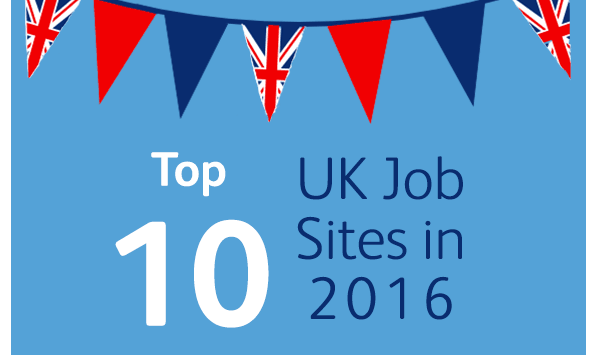 What are the top 10 UK job boards? 1) Indeed – Named no.1 jobsite wordwide for the third year in a row! They receive over 180 million unique visitors each month and is available in over 50 countries. 2) www.gov.uk/jobsearch – The official job centre website for the UK. Allows job seekers to apply for full or part-time jobs in the UK. 3) Reed.co.uk – Reed was the first agency to offer a job board. They feature vacancies from over 25,000 recruiters and they receive over 160,000 applications every day. 4) TotalJobs.com – TotalJobs attracts over 6 million job seekers every month, receiving around 2 million monthly job applications. 5) CV-library.co.uk – CVLibrary currently has over 138,000 live job vacancies listed from across the UK, covering over 70 industries. 6) JobSite.co.uk – JobSite was launched 18 years ago and matches candidates with recruiters and employers. 7) Monster.co.uk – Monster is one of the oldest job boards and is still a go to for thousands of job seekers. They offer job search advice, as well as vacancies. 8) Jobs.nhs.uk – A dedicated recruitment service for the NHS. The visit receives over 6 million monthly visits and 250,000 job applications. 9) Fiverr.com – Fiverr is a global online marketplace allowing freelancers to office services at $5 per job. They list over 3 million services on the site. 10) www.jobs.ac.uk- Has become the leading international job board for jobs in academic, research and science professions. They help over 700 organisations worldwide to recruit the best academic staff.